There is an oasis of tranquility and serenity just minutes from the hectic 70 mile per hour speeds of Florida's I-95 and the crowded streets South Florida's many shopping and business districts. Even Florida natives have driven by without noticing this historical landmark but for those who do stop, they discover one of South Florida's gems - the Morikami Museum and Japanese Gardens. Trendy Delray Beach is well known for its' upscale, boutique shopping, fine dining, beautiful beaches and a world class professional tennis tournament. Who knew that there were some of the most beautiful and peaceful gardens dedicated to Japanese arts and culture there as well? The Morikami Museum and Japanese Gardens is a must-see stop on any trip to Delray Beach and South Florida. 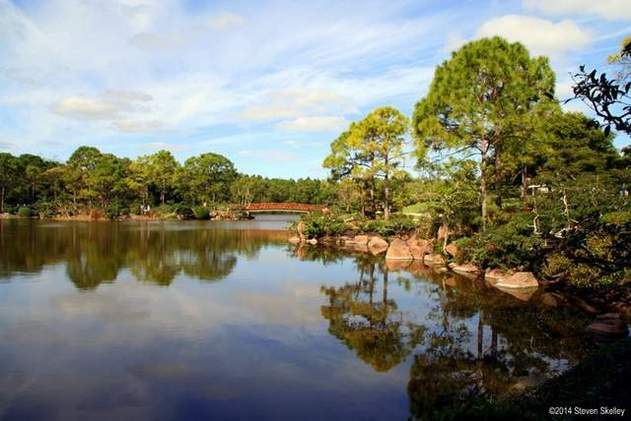 The story of Morikami Museum and Japanese Gardens began in 1904 when Jo Sakai of Miyazu, Japan organized a group of Japanese farmers and convinced them to move to Florida. With aid from Henry Flagler’s East Coast Railroad and the Model Land Company, they formed the farming colony Yamato - an ancient name for Japan. Though they attempted various crop experimentation methods, the Yamato Colony venture failed and most of the families returned to Japan or relocated to other areas in the USA by the 1920's. George Morikami, the lone settler to remain, continued to grow crops until the 1970's when he donated his land to Palm Beach County with the wish to preserve it as a park and to honor the memory of the Yamato Colony. According to their website, "The mission of the Morikami Museum and Japanese Gardens is to provide authentic Japanese cultural experiences that entertain, educate, and inspire.Since its opening in 1977, The Morikami Museum and Japanese Gardens has been a center for Japanese arts and culture in South Florida, with rotating exhibitions in its galleries, tea ceremonies performed monthly in its Seishin-an tea house, an educational outreach program with local schools and organizations, and Japanese traditional festivals celebrated for the public several times a year." The original building, named the Yamato-kan, is modeled to suggest a Japanese villa. It features a ring of exhibition rooms embracing an open-air courtyard with a dry garden of gravel, pebbles and small boulders as well as exhibition galleries, 225-seat theater, authentic tea house with viewing gallery, library, classrooms, museum store, cafe and lakeside terrace with Japanese courtyard garden. The Morikami Museum Collection holds 5,000 Japanese art objects and artifacts, including a 500-piece collection of tea ceremony items, more than 200 textile pieces and recent fine art acquisitions. Morikami Museum and Japanese Gardens consists of 200 acres of expansive Japanese gardens with strolling paths, resting areas, tropical bonsai collection, small lakes with koi, nature trails, pine forests and park and picnic areas. Each garden is "intended to express the character and ideas of a unique counterpart in Japan without attempting to duplicate those gardens, and seamlessly flow together as one garden." The Morikami Museum and Japanese Gardens offers on-site dining at their Cornell Cafe. It features both open-air cafe on the terraces and an indoor air-conditioned area which overlook the gardens and serve a Pan-Asian inspired menu. Programs include Calligraphy Workshops, Sushi and Stroll, Tea Ceremony, Speaker Series, Member Appreciation events and ongoing Current Exhibits. Upcoming special events include Oshogatsu New Year Celebration, Hatsume Fair, Lantern Festival in the Spirit of Obon, and Sushi & Stroll Summer Walks. The Morikami Museum and Japanese Gardens offers both an on-site and online store featuring "a broad assortment of items that reflect the Japanese culture and aesthetic as well as items that relate to the garden."